Late Friday morning, walking into the Hotel Monteleone in New Orleans with my coffee, I bump into Jeffrey Morgenthaler of Eugene, Oregon. He’s one of the many blogger-bartenders featured at Tales of the Cocktail this year. He tells me that at 9:00 p.m., he, Daniel Shoemaker from the Teardrop Lounge in Portland, Oregon, and Erik Adkins from the Slanted Door in San Francisco are planning a mix-off at the pool on the roof of the Monteleone. 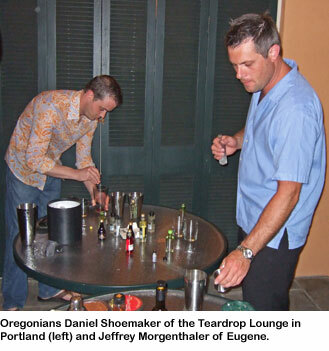 The kicker is that their ingredients can come only from Jeff’s swag bag — the pile of nips, mixers and other cocktail accoutrements that sponsors give presenters at Tales. I say I’ll be there, thinking, ‘That’s the best idea I’ve heard all week.’ I tell my fellow Bostonian and Tales blogger Misty Kalkofen about it, and she wants in. We judges declare Daniel’s Seat of the Pants, with its inventive melange of Angostura bitters, agave nectar, gin, grappa, Campari and, yes, chili powder, the winner. Jeff’s is a close second — it’s a bit too fruity for us (I liken it to Tropical Lifesavers), but it is actually a balanced cocktail. And Erik’s is the oddball, with the most gentle flavor of all despite a whopping two ounces of gin. Later that night and the next day, everyone involved in the swag-off tells everyone they know about it, and word of this brilliant idea spreads quickly. Walking into the Napoleon House for lunch on Saturday, I bump into one of the drinks world’s biggest celebs, David Wondrich. He says, “Hey, I heard about the mix-off last night. That sounds great.” Damn, I think Swag-Off ’09 is going to need a bigger pool.